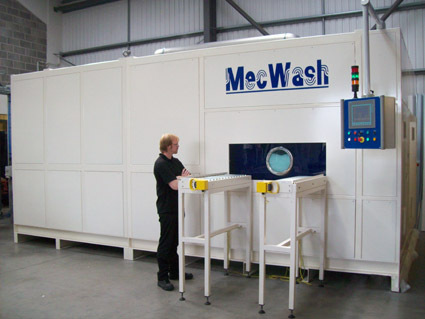 As a market leading manufacturer of aqueous component cleaning systems, MecWash works closely with its clients to deliver machines that meet their individual, and sometimes unique, requirements. A recent project resulted in MecWash’s largest machine to date. The Tewkesbury based company provides tailored wash systems and solutions to a number of industry leaders across a variety of sectors including automotive, aerospace, defence, medical, hydraulics and pneumatics. In 2011, MecWash was approached by one of its existing customers, a leading UK manufacturer in the aerospace industry, with a very specific cleaning requirement for bearing housing engine components used in civil and defence aircraft. The bearing housings are made of super alloys and the oil and swarf contamination created in the manufacturing process must be completely removed before the bearing housings are used in an engine assembly. Although MecWash is used to precision cleaning requirements, it is unusual to have such high cleanliness specifications for components almost a metre in diameter. The challenge in this particular application was adequately flushing out the internal galleries, channels and tubes. This was overcome by incorporating dedicated jetting into the design of the bespoke machine, so that jets rotated with the component, continuously spraying wash solution into key contamination traps, flushing them clean. MecWash worked closely with the customer to identify the issues it had experienced with its existing immersion equipment, which had not been meeting the company’s stringent cleanliness specifications. The results of this research led to MecWash designing and building its largest machine to date, based on existing designs and uprated to handle the large component size and heavier weights. The first ‘SuperMaxi’ was born and has been in use on the customer’s site for over eighteen months. The customer is very pleased that the machine continuously meets its stringent cleanliness specification. The wash, rinse and dry process used in the SuperMaxi features a high flow rate designed for flushing complex components. The components are held in a wash chamber and water is pumped through and around the rotating parts at 500-2000 litres per minute, depending on the process stage. The combination of high flow wash and rinse solutions and dedicated jetting provides extremely powerful cleaning and highly successful contaminant removal. The importance of clean components is paramount in all applications, and even more so in industries such as aerospace where substandard equipment could potentially cause operational issues. The SuperMaxi wash, rinse and dry system is built to the same robust specification as the rest of MecWash’s machines, and because the customer had previous experience of working with MecWash, it knew that it was ordering a high quality product capable of consistently performing to the highest standards. As with BladeWash, another recent addition to MecWash’s product range, whilst the SuperMaxi was originally designed for a very specific application, it can be adapted to flush out debris/oils from a number of different large components with complicated geometries. The machine is now available as part of MecWash’s standard range for such applications.